Screengrab from a viral video showcasing a confrontation between a Native American drummer and a group of Catholic high school students in Washington, D.C. on Jan. 18, 2019. Screenshot via YouTube. 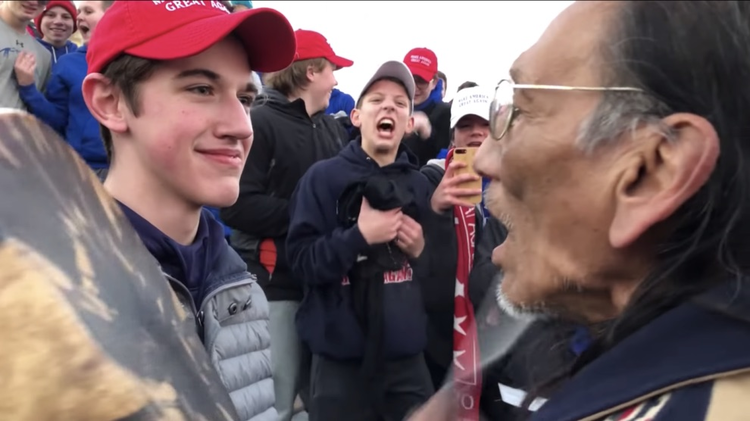 WASHINGTON (CNS) -- An independent investigation into the much-discussed encounter that went viral between Catholic high school students, a Native American tribal leader and members of another protest group on the Lincoln Memorial grounds in Washington in January found no evidence that the students of Kentucky's Covington Catholic High School issued "offensive or racist statements." The investigation "demonstrated that our students did not instigate the incident that occurred at the Lincoln Memorial," the bishop said. Bishop Stowe: Why the MAGA hats at the March for Life? Bishop Foys said that in the weeks since the original video went viral "two well-worn and oft-used adages have come to mind: Seeing is believing and perception is reality." The report by outside firm may have "said it all" but seeing is believing and I saw what I saw. To say the red maga hats were innocent is the height of naivette. Barack Obama did not try to divide those hats sent a clear message and it had 0 to do with being pro choice. Maybe they did not "say" anything but their attitudes and that smirk said it all. The videos were damning. I find it interesting that the two principals involved were not interviewed. In any case most schools have dress policies for sponsored trips. More so should religiously sponsored school. I have a hard time believing the school is that naive. So, you are saying the First Amendment does not apply to these high school students, or to anyone who supports returning this nation to the greatness that has been squandered over the past 60-70 years. Your attitude is the one out of alignment. You say the boy was smirking. A man walked up to him and began beating a drum in his face. Maybe he was trying to smile at the drum beater. I think if you or I were photographed at any one point in time, someone else could read something negative into our faces. Or more simply: "A man convinced against his own will is of the same opinion still!" after learning of the drummer's actions in forcing his way into the boy's space, rather than the contrary, i congratulate the young man on maintaining a steely smile in the situation, refusing to look hostile or angry. The word "smirk" seems an incorrect nomenclature, unless one can read into the person's mind... Novelists and teachers can handle that one better than an unengaged bystander or eager reporter. Could the reason the investigators could not speak with Mr. Sandmann and Mr. Phillips be because both of them are planning to sue various entities and people? I hope they both sue the media outlets involved, Covington Catholic High School, the Diocese of Covington, and Bishop Foys personally. All of these nincompoops rushed to judgment and smeared both Mr. Phillips and Mr. Sandmann. Surely true journalists and bishops know to get the facts before making a judgment. Obviously not. Mrs. Trump won $2-3 million dollars the other day from British "professional" news outlets. They never learn and they don't care - journalists, bishops, and so many others. I mean Melania is no example for any kind of integrity. How was Phillips smeared? The article says he was beating a drum within inches of the boy. That, I believe, is technically assault. He is an adult assaulting a minor. I think the investigators are naive at best and the chaperones were negligent in not intervening quickly enough to break up the students' confrontation with the Native American elder. It appears that the 4 or 5 black Hebrew Israelites began yelling denigrating and obscene catcalls to the Catholic school group and the students responded with school cheers. This was a great way to respond to the heinous behavior they encountered. Then the elder steps in drumming a peace chant that the students probably didn't understand. Then a student walks up to the elder, inches from his face, and stares at the sole elder with a smirk while the student body stands behind him doing the tomahawk chop and the chaperones passively look on. If a young man stood inches in front of your face with a stare and a smirk, as captured in the video, how would you feel? If this was a friendly encounter by the student, why didn't he say hello or introduce himself? If a group of young men made offensive gestures about your ethnicity at you, how would you feel? Empathy is a virtue for all of us. I don't think Phillips yelled "Go back to Europe," though someone in his group may have. While it is our First Amendment right to show nastiness, is this to be condoned or encouraged as Catholics? “No connection to ... ” anyone? Wouldn’t elementary journalistic integrity ask, who paid you to do this investigation, then disclose the answer? Interesting comments...as a Catholic school alumnus 1-12 and mother of a student who also attended. Also a chaperone for student trips my questions were always what was wrong with the "chaperones"? There should have been intervention long before. Anyone who's been to Washington knows there are groups protesting something every day. Also when I was a chaperone or my daughter was going permission slips with outline of trip and expectations for dress, behavior were clear. In essence..you are representing yourself, your family, school and Catholic faith. Behave accordingly. Is this not expected from Catholic schools anymore? Chaperones should have moved the students away from the situation . The hats should not have been worn at a pro life rally. "hate on their faces". Try yelling anything ("I love my children") with someone filming you. What look is on your face? what is Bishop Foys going to do to atone for his own initial rush to judgement? At the very least he needs to put a lot of energy into disseminating this investigative report on social media which condemned the Catholic students on flimsy evidence. This independent report confirms what the reporter for Atlantic magazine discovered when she took the time to review all the tapes and also exonerated the students. Sadly the damage has already been done, but I hope the Sandman boy sues the hell out of the vindictive media. One other puzzling thing--there is no mention of the Covington principal saying anything about this independent investigation--does the Bish outrank the school CEO? Do all Catholic schools share this lack of autonomy? The Bishop apologized, and has since made statements in support of the boys. I think that's fine. What do you want him to do, walk across broken glass? Now that they are cleared, Bishop Foys should feel free to have "MAGA" embroidered on his miter.